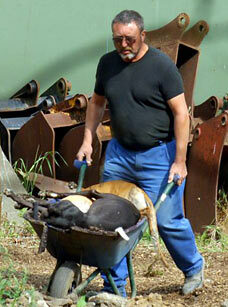 Anotherday, another death: this man slaughters greyhounds on an industrial scale. DAVID SMITH met the owners of the two greyhounds at his garden gate and pocketed £10 from each as he took hold of the makeshift leads. With his chained-up rottweilers looking on, the bearded and bespectacled Smith led the lithe racing dogs — one a fawn- coloured brindle and the other black with white markings — across his plot and into a breeze-block shed. The animals appeared sprightly and alert as if they hoped they might soon be allowed off the lead for a run. But seconds later two sharp reports rang out. They had been killed. Anyone who had worked in an abattoir would have recognised the sounds as the discharging of a bolt gun, a weapon that fires a metal bar with enough force to smash the toughest skull. The dogs emerged lifeless and limp in Smith’s bloodied wheelbarrow. He dumped them in a freshly dug hole on one side of his one-acre garden before covering the grave with earth using a mechanical digger.